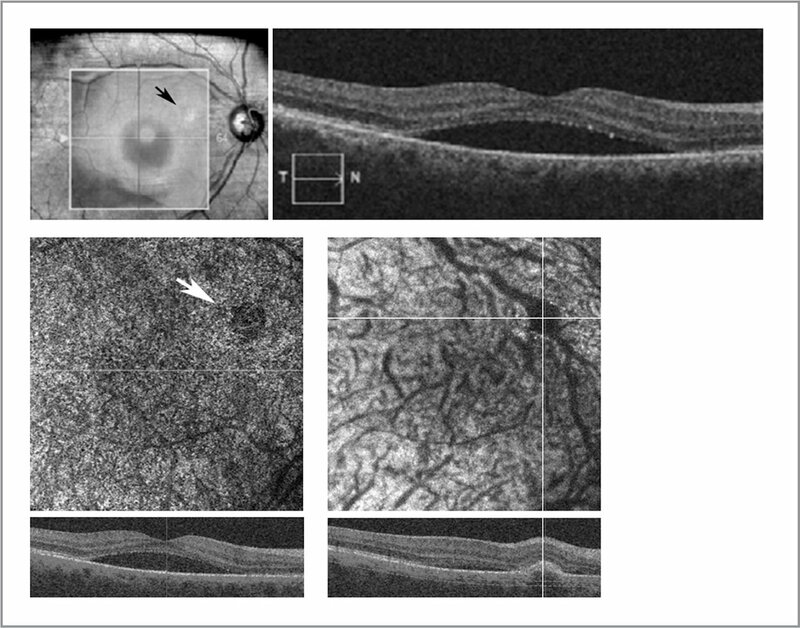 To report the acute and long-term choroidal findings in patients with chronic central serous chorioretinopathy (CCSC) undergoing half-fluence photodynamic therapy (PDT). This is a prospective, consecutive, interventional, noncomparative case series at a tertiary referral vitreoretinal practice. Twenty-one eyes from 21 patients are included. Among 21 eyes, all had improved vision following PDT during a mean of 5.2 months ± 4.8 months of follow-up. The incidence of choroidal neovascular membranes was 19.0% (four in 21), with only one of these eyes (4.8%) requiring intravitreal anti-vascular endothelial growth factor injections. Changes in the choriocapillaris were noted in 28.6% (six of 21) eyes following PDT. Eighteen patients (85.7%) demonstrated striking regions of dilated choroidal vessels closely corresponding to regions of outer retinal changes and subretinal fluid. Twenty patients (95.2%) experienced resolution of subretinal fluid within 3 months of receiving PDT. Optical coherence tomography angiography may provide new insight into the pathogenesis of CCSC, namely in identifying a correlation between structures of the deep choroid and changes in the retinal pigment epithelium and neurosensory retina. An impediment of studying CCSC and the therapeutic effect of PDT is visualization of the choroid. Although traditional dye-based angiography has yielded much relatively new insight into the disease, choroidal imaging is still limited by the poor visualization of the oftentimes fine vasculature of the choroid (with the likely subtle changes affected by PDT even less reliably captured). Furthermore, the anatomic changes of CSR such as subretinal fluid accumulation, RPE detachments (co-occurring in upwards of 70% of cases), and choroidal vascular congestion1,2,8,24,25 are uniquely suited to further impair resolution of choroidal anatomy using dye-based angiography. The advent of optical coherence tomography angiography (OCTA), however, provides an excellent tool to circumvent these challenges. Specifically, its advantages in providing, rapid, noninvasive, non-dye-based assessments of depth-resolved vascular flow are well-suited to studying CCSC and its immediate, short-term and long-term response to PDT. We therefore prospectively performed OCTA on 21 consecutive patients with CCSC before and after undergoing half-fluence PDT to both better explicate the pathogenesis of the disease and its response to treatment. The institutional review board at Stanford University approved this prospective, consecutive, interventional, noncomparative case series. Compliance with HIPAA and adherence to the Declaration of Helsinki and all federal and state laws in the United States were maintained during all aspects of this research. A signed informed consent was obtained from all patients. Twenty-one consecutive patients with CCSC undergoing half-fluence PDT were enrolled between November 1, 2015, and September 1, 2017. This consisted of 13 male patients and eight female patients with a mean age of 54.1 years ± 13.2 years (range: 39 years to 78 years). All patients received standard ophthalmological examinations including measurements of refractive error and best-corrected visual acuity, slit-lamp biomicroscopy, and fundus examinations. Additionally, spectral-domain optical coherence tomography (SD-OCT) and fluorescein angiography (FA) images were obtained from all patients. OCTA was performed at each visit: immediately prior to half-fluence PDT, immediately following treatment, and at each subsequent post-procedure visit. OCTA was performed using the Zeiss AngioPlex OCT angiography instrument (Carl Zeiss Meditec, Dublin, CA). This device utilizes wavelengths of 840 nm, a scan rate of 68,000 A-scans per second with a tissue depth of 2.0 mm (1,024 pixels), as well as axial and transverse resolutions of 5 μm and 15 μm, respectively. The 3 mm × 3 mm and 6 mm × 6 mm raster scan patterns were used. Analysis was performed initially using the default segmentation boundaries for the choriocapillaris and deeper choroidal vasculature with the contours of the segmentation boundaries also adjusted to generate customized en face flow images for each layer when the automated segmentation was perturbed or rendered inaccurate, most often by pathologic findings (ie, RPE detachments). PDT was performed with a half-fluence protocol: 6 mg/m2 body surface area of verteporfin (Visudyne; Novartis AG, Basel, Switzerland) was intravenously administered to patients during a period of 10 minutes. Five minutes after this was completed, a 689 nm wavelength diode laser (Visulas 690S; Carl Zeiss Meditec, Dublin, CA) was used to deliver a total of 25 J/cm2 of light energy over 83 seconds to a selected area of the retina as determined by fluorescein angiography leakage. All patients had OCT-confirmed subretinal fluid for at least 3 months prior to PDT, with the mean duration of disease by history being 23.8 months ± 33.3 months (range: 3 months to 144 months). At the time of PDT, mean best-corrected visual acuity (BCVA) was 0.37 logMAR ± 0.24 logMAR (Snellen 20/40; range: 20/20-1 to 20/200). Average PDT spot size was 3.2 mm ± 1.3 mm (range: 0.9 mm to 4.3 mm). BCVA at last follow-up was 0.19 logMAR ± 0.16 logMAR (Snellen 20/30; range: 20/20 to 20/70) with no eye losing vision. Twenty patients (95.2%) experienced resolution of subretinal fluid within 3 months of receiving PDT. Choroidal neovascular membranes were present in four of 21 eyes (19.0%), with evidence of these lesions present in all eyes prior to PDT (Figure 1). Two of the four eyes (9.5%) demonstrated clear growth of these lesions on follow-up examination and OCTA. One of these eyes (4.8%) demonstrated exudative changes on follow-up 23 months after photodynamic therapy prompting intravitreal anti-VEGF therapy. Choroidal neovascular membrane (CNVM) in chronic central serous chorioretinopathy. 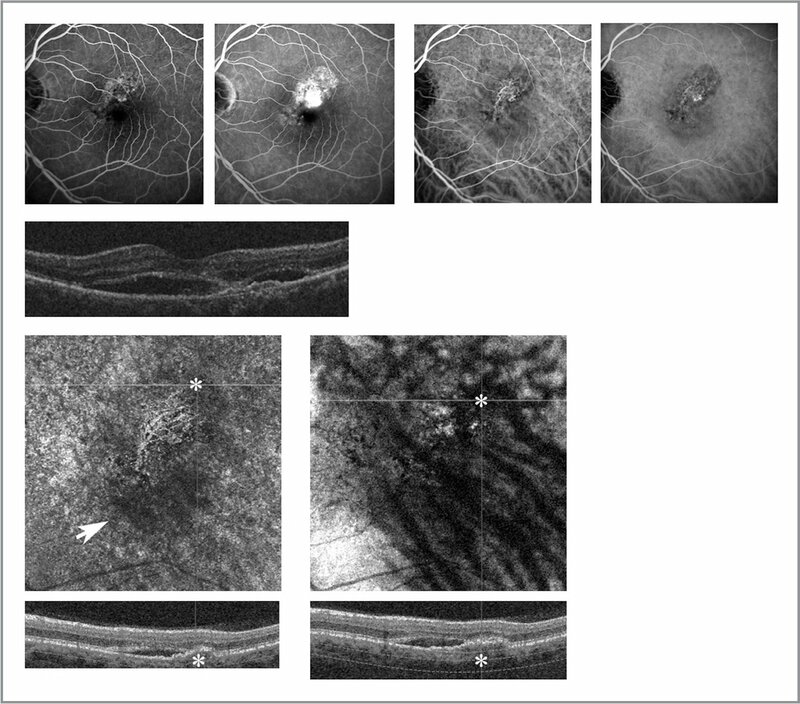 First column: En face optical coherence tomography angiography (OCTA) immediately prior to half-fluence photodynamic therapy (PDT) with segmentation through the choriocapillaris, demonstrating evidence of a tangled vascular network consistent with a CNVM (top). Relative signal void likely due to projection artifact from overlying serous retinal detachment evident on the structural OCT (bottom). Second column: OCTA 2 weeks after PDT with more clearly defined CNVM and decreased flow void (top) with a corresponding decrease in subretinal fluid (bottom). Third column: OCTA 2 months after PDT demonstrating increasing size of CNVM (top) with complete resolution of subretinal fluid and retinal pigment epithelial detachment (bottom). 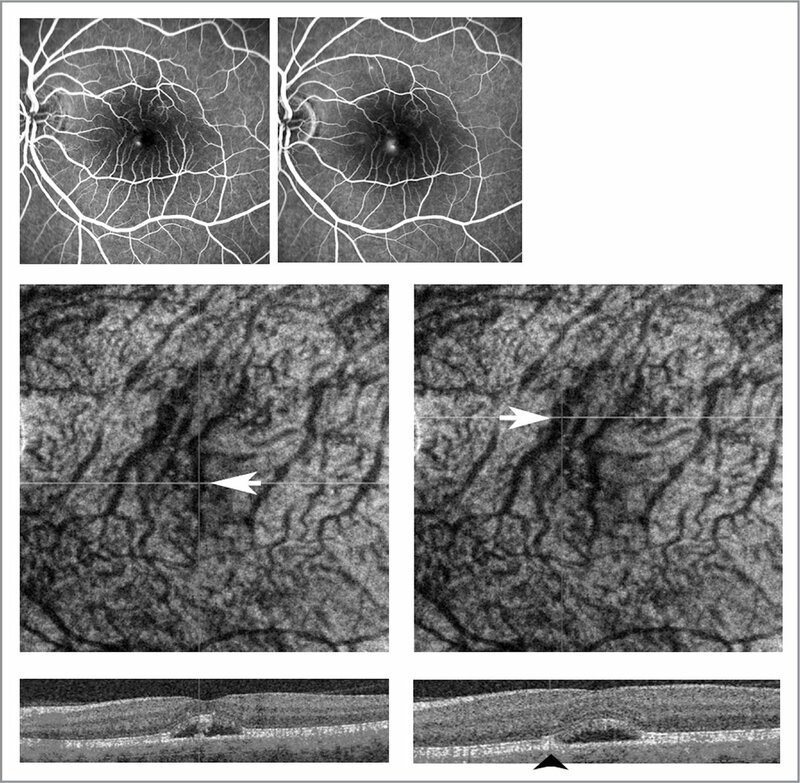 Fourth column: OCTA 11 months after PDT demonstrating further increase in size of CNVM (top) with no exudative changes noted on structural OCT (bottom). After half-fluence PDT, six of 21 eyes (28.6%) of eyes demonstrated persistent changes in the choriocapillaris demonstrable on OCTA (Figure 2). Baseline (pre-PDT) OCTA images revealed abnormal choriocapillaris flow, which remain unchanged at post-procedure day 0 and post-procedure week 2 scans. By week 6, these six eyes demonstrated increasing hypoperfusion of the irradiated region which persisted until last follow-up in all patients. The remaining eyes (15 of 21, 71.4%) demonstrated no changes on OCTA following PDT treatment (Figure 3). Response of the choriocapillaris to half-fluence photodynamic therapy (PDT). First column: En face optical coherence tomography angiography (OCTA) immediately prior to half-fluence PDT with segmentation through the choriocapillaris, demonstrating central flow void with an area of irregular reticular flow. Overlying subretinal fluid (SRF) and small retinal pigment epithelium detachment (PED) evident on the structural OCT (bottom). Second column: OCTA 2 weeks after PDT with heterogeneous small vessel flow. Structural OCT (bottom) demonstrating near resolution of SRF. Third column: OCTA 6 weeks after PDT with expanded central area of decreased choriocapillaris flow (top) with resolution of SRF (bottom). Fourth column: OCTA 12 months after PDT with altered pattern of increased small-vessel flow and further expansion of central hypoperfused region. Minimal changes on structural OCT are noted (bottom). Response of choriocapillaris to half-fluence photodynamic therapy (PDT). First column: En face optical coherence tomography angiography (OCTA) immediately prior to half-fluence PDT with segmentation through the choriocapillaris demonstrating central flow void (top) with overlying serous retinal detachment and small retinal pigment epithelial detachment (bottom). Second column: OCTA 2 weeks after PDT with decreasing flow void (top) and decreasing subretinal fluid (bottom). Third column: OCTA 10 months after PDT with relatively homogenous flow pattern, save minor areas of increased vessel caliber and flow (top). Corresponding structural OCT demonstrates fluid resolution. The most consistent and striking changes noted on OCTA were aneurysmic vessels of the deep choroid, which appeared in 18 of 21 eyes (85.7%). The remaining cases (four of 21 eyes; 14.3%) had segmentation of the deeper choroid of too poor in quality (mainly due to artefact) to distinctly render large vessels in sufficient detail. In all eyes where these dilated vessels were noted, they were highly correlated spatially with retinal pigment epithelial detachments (PEDs) (Figure 4) or RPE changes and areas of leakage on FA underlying the patient's serous retinal detachments (Figure 5). Notably, no clear change in the caliber of these vessels was noted in response to PDT in any patient. In two cases where CNVMs were present, the area of choroidal vessel dilatation was more strongly correlated with changes in patient's retinal pigment epithelium (such as PEDs) than the CNVM (Figure 6). In 13/21 eyes (61.9%), dilated choroidal vessels were identified in the contralateral eye corresponding to subclinical RPE changes (Figure 7). Choroidal vessels in chronic central serous chorioretinopathy. Spectral-domain optical coherence tomography (OCT) map (top left) and B-scan (top right) demonstrating central subretinal fluid (SRF) and superonasal pigment epithelial detachment (PED) (black arrow). En face OCT angiography (OCTA) with segmentation of the choriocapillaris demonstrating superonasal flow void (white arrow, middle left) and central SRF (bottom left). OCTA with segmentation of Haller's and Sattler's layers demonstrating superonasal Haller's Layer aneurysm with slice navigators (white lines) aligned with corresponding retinal PED. Choroidal vessels in chronic central serous chorioretinopathy. Fluorescein angiography (FA) demonstrating “expansile ink blot” with early punctate hyperfluorescence (top left) and late leakage (top right). En face optical coherence tomography angiography with segmentation of Haller's and Sattler's layers demonstrating collection of large vessels (white arrow, middle left) with focal dilatations corresponding to pathologic pigment epithelial detachment (PED) (bottom left) as well as PEDs with no leakage on FA (white arrow, middle right and black arrowhead, lower right). 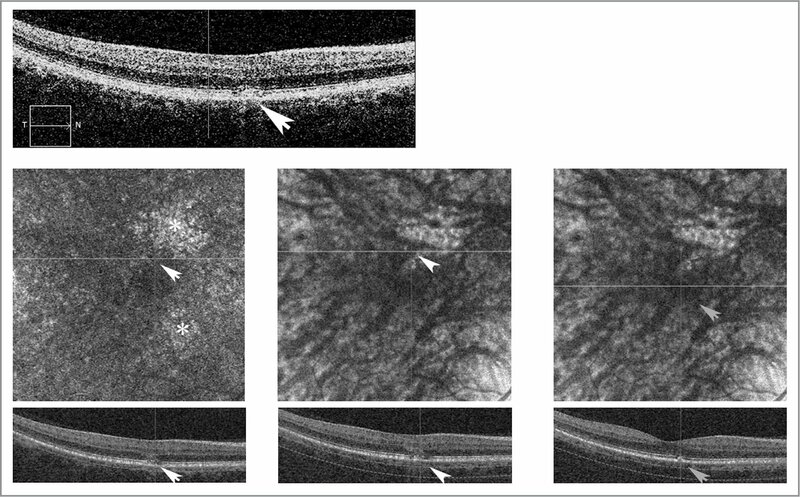 Multimodal imaging of chronic central serous chorioretinopathy (CCSC). Top row: Fluorescein angiography demonstrating superior parafoveal early hyperfluorescence (first panel) with late leakage (second panel) in the left eye of a patient with CCSC. Early punctate staining is also visible at the nasal parafovea. Indocyanine green (ICG) angiography clearly delineating a type I choroidal neovascular membrane (CNVM) (third and fourth panel). Second row: B-scan of superior paracentral macula demonstrating subretinal fluid and an irregular, flat pigment epithelial detachment (PED). En face optical coherence tomography angiography (OCTA) with choriocapillaris segmentation (third row, left) demonstrating central flow void (white arrow) with CNVM, which corresponds poorly to irregular PED (asterisks, third and fourth rows, left). En face OCTA with segmentation of Haller's and Sattler's layers (third row, right) demonstrating focal large vessel dilatations corresponding more closely to irregular PED (asterisks, third and fourth rows, right). Choroidal vessels of the contralateral eye of a patient with chronic central serous chorioretinopathy (CCSC). Spectral-domain optical coherence tomography (OCT) B-scan (top row) with focal retinal pigment epithelium (RPE) and outer neurosensory retinal changes (white arrow) in the asymptomatic right eye of the patient depicted in Figure 6. OCT angiography (OCTA) segmentation of the choriocapillaris (middle left) demonstrates limited changes corresponding to the noted outer retinal changes (white arrows, bottom left), though superonasal and inferonasal areas of aberrantly increased flow are noted (white asterisks). OCTA segmentation of the deeper choroid reveals focal aneurysm of large vessel (white arrowhead, middle row, center) closely corresponding to superior RPE and outer retinal changes (white arrowhead, bottom row, center). OCTA segmentation of the deeper choroid similarly shows a different focal aneurysm of a large choroidal vessel (gray arrow, middle row, center) closely corresponding to central RPE and outer retinal changes in another area of the retina (gray arrow, bottom row, center). This study reports three main findings with regard to CCSC. Firstly, choroidal neovascular membranes are not an uncommon occurrence. Secondly that choriocapillaris changes on OCTA do not correlate well with disease course. And finally, deep choroidal vessel changes likely contribute significantly to the pathogenesis and retinal findings of this disease. Perhaps the most clinically relevant benefit of OCTA is with regard to identifying CNVMs in CCSC. Prior to OCTA, estimates of CNVM prevalence in CCSC patients were 2% to 9%.8,24,26 Sources of considerable ambiguity in their identification are the overlapping clinical signs between CCSC alone and Type I CNVMs (either from CCSC or occurring from other diseases such as exudative age-related macular degeneration) such as SRF, PEDs, retinal atrophy, late leakage on fluorescein and indocyanine green angiography, and RPE pigmentary changes.8 OCTA appears invaluable in this regard, with prior reports also corroborating higher rates of CNVM detection with OCTA than conventional dye-based angiography. With OCTA for example, CNVMs have been detected in 24% to 30%27,28 of patients with CCSC, with the subset of patients presenting a flat, irregular PED having an even higher rate of CNVM (35.6% to 41.9%).29, 30 This report demonstrated a slightly lower rate (four of 21 cases; 19%) of CNVM with all four cases showing initial resolution of SRF with half-fluence PDT alone. Two of these cases would show enlargement of the CNVMs by 2 months after half-fluence PDT. One would develop exudative changes (PED, subretinal fluid and exudate) necessitating anti-VEGF treatment starting 23 months after PDT, to which their vision returned to baseline levels. The second patient demonstrating CNVM growth on OCTA showed no further SRF recurrence (or other exudative signs of a CNVM) by last follow-up approximately 11 months following their half-fluence PDT treatment. The final two patients had less than 6 months of post-PDT follow-up but showed no evidence of CNVM growth during this time. In patients with CCSC with CNVMs noted on OCTA, whether anti-VEGF treatment is indicated prior to exudative changes most specific to CNVMs (hemorrhage, extravascular lipid deposition, intraretinal fluid, focal RPE breaks) remains unclear. Prior studies now comprise a growing body of literature noting the relationship between dilated choroidal vessels and neurosensory retinal diseases encompassed by the relatively new term “pachychoroid spectrum disease.”39 Although diseases such as polypoidal choroidal vasculopathy40 and pachychoroid neovasculopathy41 also belong to this class, the raison d'etre for this classification stems from findings in central serous chorioretinopathy.42 In fact, the subclinical RPE findings we describe in the asymptomatic, contralateral eyes of patients with CCSC (Figure 7) titled a study describing this “new clinical entity” as ‘pachychoroid pigment epitheliopathy’ and first heralded use of the term ‘pachychoroid.’39 Those authors astutely used fundus observations, SD-OCT with enhanced depth imaging (EDI-OCT), fundus autofluorescence (FAF), FA, and ICGA to note that “localized areas of choroidal thickening were present directly below” RPE alterations. They further note that their work builds on prior ICGA based reports suggesting dilated regions of choroidal vessels to underlie serous PEDs.13 Although those authors note that “EDI-OCT is not always precise and reproducible,”42 our current work firmly validates their hypothesis using OCTA, which allows for better visualization of the choroid. Subsequent work (by some of the same authors) postulates that dilated choroidal vessels (since termed ‘pachyvessels’) may cause RPE dysfunction by direct microtrauma (possibly from pulsatile flow) or by localized ischemia from loss of overlying choriocapillaris.39 Our series cannot distinguish between these causative factors but corroborates the loss of choriocapillaris directly overlying these pathologic choroidal vessels. Summarily, we here present a prospective study describing the choroidal findings on OCTA in patients with CCSC undergoing half-fluence PDT. The vascular and neovascular changes we have noted to the choriocapillaris and findings of the large choroidal vessels build on substantial prior work in both areas. Future studies are needed to better quantify the changes we here note so as to optimize evaluation and treatment of CCSC. Gass JD. Pathogenesis of disciform detachment of the neuroepithelium. Am J Ophthalmol. 1967;63(3):Suppl:1–139. Maumenee AE. Macular diseases: Clinical manifestations. Trans Am Acad Ophthalmol Otolaryngol. 1965;69:605–613. Yoshioka H, Katsume Y. Experimental central serous chorioretinopathy. III: Uultrastructural findings. Jpn J Ophthalmol. 1982;26(4):397–409. Gomolin JE. Choroidal neovascularization and central serous chorioretinopathy. Can J Ophthalmol. 1989;24(1):20–23. From the Department of Ophthalmology, Stanford University School of Medicine, Palo Alto, CA. This research was supported in part by Research to Prevent Blindness, New York, NY. Address correspondence to Ruwan A. Silva, MD, The Byers Eye Institute at Stanford, 2452 Watson Court, Palo Alto, CA 94305; email: ruwansilva2002@gmail.com.